We are a leading Wholesale Trader of sarees, designer sarees, bridal saree, designer party wear, myraa of saree and hitansh saree from Surat, India. Backed by our rich industrial experience and exposure in this domain, we are devotedly involved in presenting wide assortment of Sarees. These sarees are stitched by employing pure quality of fabric and our advanced tools in accordance with the latest fashion trends. 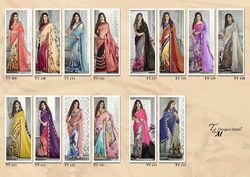 Clients can avail these offered sarees from us in a variety of colors, shades, patterns and designs to suit their requirements and needs. With enriched industrial experience and knowledge of this domain, we are manufacturing an excellent range of Designer Sarees. Designed beautifully, these sarees provide a trendy and stylish look to the one who wears them. Offered assortments of sarees are made by using quality approved fabric that is sourced from the reliable and authentic vendors of the market and the modern technology. Keeping in mind the different tastes of our clients, we are providing these sarees in variety of designs and sizes. In order to providing the optimum level of comfort to the wearer, the Sarees provided by us is pioneer in setting the modern trends. The intricately knitted assortment of sarees provides the complete satisfaction to our respected customers. We are providing the best possible designs to our clients in a variety of sizes and colors. 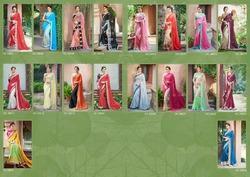 Our sarees are offered at industry leading rates within the committed period of time. In a bid to offer the qualitative range of Dress to our huge clientele, we are engrossed in offering a wide array of Sarees. These sarees give optimum satisfaction to the wearer in terms of softness and trend. To suit the clients' specific requirements, we are also providing these sarees in customized options. The entire ranges of sarees are offered at industry leading rates with best packaging option.